Woo Hoo. I need one of them. Of course the t-shirt wearer is related to Dave. And ya know, the beer will eventually produce gas anyway...so it's win-win. I'd like to amend that t-shirt. 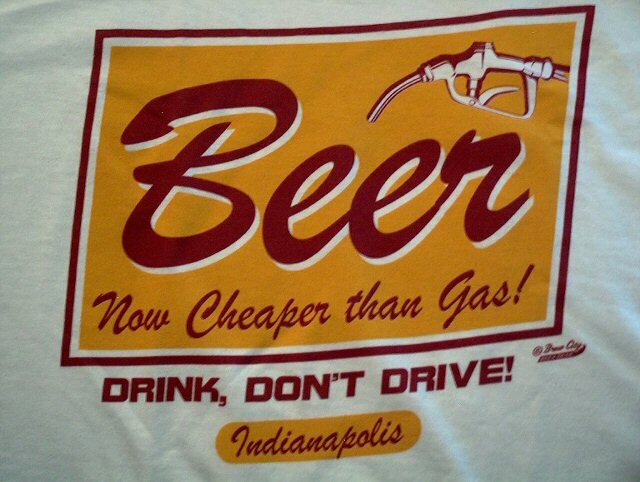 "Crap beer is cheaper than gas"
P.S. ....In bats of various potent potables, that is. Criminy, ALL our posts are about bodily functions. P.P.S. AAAAArgh! VATS, not BATS. And body PARTS, as well as bodily FUNCTIONS!!!>. OK...it's official: my last brain cell just succumbed. R.I.P., little fella. Don't feel bad Betsy. There's actually a cute science fiction book titled 'Vats, Bats and Rats'. I used this in a story over a month ago. And you can buy beer at gas stations, which means they have both, markets covered! The nerve! You have it all wrong. You can't buy beer, you can only rent it. Good luck trying to get THAT security deposit back! I refuse to drink any beer that's going to cost less than $3 a gallon, that's just disgusting. classic style and great one.